Today we had exams for children and 6th Kyu candidates. Everyone passed! Since I wasn’t testing, I was free to do a little photography. “The kanji for sensei is a man leading an ox by a nose ring. This indicates that through wisdom and intelligence a teacher is able to guide even that which is difficult and resistant. Sen depicts the earth giving birth to a plant, which in turn yields a flower or fruit. From this image we are reminded that life comes from life, that learning and growth come from a living transmission. Sei is often spoken of as Heaven, Human, and Earth united to create something new and useful. With the symbols placed together, sensei or teacher is someone who has more experience than us, whose consciousness is more expanded, who has walked before us on the path that we are now on, and who embodies a vision of the world that is more powerful than the one we now live in. Sensei is able to guide students on the steps that are necessary for them to gain proficiency in a specific discourse. A teacher is someone willing to cultivate our own life so that it will bear fruit." While the explanation of the symbols escapes me, the sentiment rings true. The entire chapter is a very interesting look at what it is to be a teacher. Elevator Speech: What is Aikido? 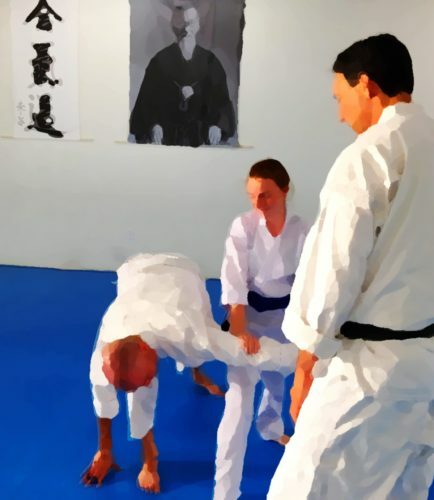 Every so often someone will ask me “So, what’s this Aikido thing that you do?” They may have some idea that’s it’s “kind of like karate,” but they rarely know anything more. I usually end up stammering something about it being “a martial art, sort of like Tai Chi, but Japanese, and not really like Tai Chi, but there’s no punching and kicking. There’s this blending, and going with the energy, and… Oh heck, just come watch a class some time.” Pathetic. So I’ve been thinking that I should come up with an Aikido elevator speech, for just such occasions. An “elevator speech,” if you haven’t heard that term, is a very brief, clear statement, usually about what you do professionally, or what your company does. Something you can say when you talk to someone for a few seconds in an elevator. There are a few tricks to an elevator speech. Obviously, it has to be short. It has to be engaging, easy to understand, and memorable. 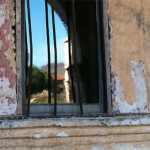 Less obviously, but most important, it needs to evoke in the listener the correct understanding. That does not mean that your explanation needs to be complete, or even accurate. It means that you have to say something that causes the right picture to form in their mind, taking into account their experience, vocabulary, and state of mind. You might even need to consider their age, gender, cultural background, etc. You have to speak in a way that they get it. Let’s look at the answer to “So, what do you do?" from one of my past careers. I was "part owner, and operations manager, of an industrial equipment distributorship selling fueling system components to major oil companies and repair contractors. We sold leak detection systems, day tanks for emergency generators, bulk fueling systems for marine and aviation applications, and…” Well, you see, your eyes have glazed over already, haven’t they? You probably stopped paying attention at “operations manager,” or certainly by the time you got to “fueling system components.” And you almost certainly have no idea what a day tank is, unless you run a high rise or hospital. By trying to be complete and accurate (not to mention sounding all businessy and official), I have entirely failed at communicating what I did. I may also have left the listener feeling stupid for not understanding me. What I ultimately came up with, which worked very well, was “I run a warehouse that sells equipment for gas stations, y’know, like pumps, hoses, and nozzles, and really big underground tanks.” Now they have something they can relate to – things they can picture. They know what a warehouse is, and probably have some idea of what running one is about. They go to gas stations all the time. They have experience with gas pumps. They can easily imagine really big underground tanks, even though they may never have thought about them before. And I said it all in a very natural (for me) vocabulary so it didn’t sound like something invented at a company meeting about elevator speeches. Presto! In about 7 seconds they knew exactly what I did. They got it. They felt smart for understanding, and sometimes even were brave enough to ask a question or two. Incidentally, those big things you drive up to are really called “dispensers” – the “pumps” are down there with the underground tanks, where you never see them. But nobody knows or cares about that. We’re not trying to say accurate things, we’re trying to help the listener create an accurate picture. Just call them pumps. You can explain later, if they care. An elevator speech about Aikido, then, might need to address preconceptions the listener could have from watching action films, or knowing someone who did another martial art when they were a kid. It should avoid using Japanese. It might need to reassure someone who thinks you could be prone to violence, or encourage someone who’s thinking of trying it out themselves. And your words should help them imagine what Aikido might look like. Images are very memorable. Use color, size, numbers – anything to help them see it in their minds. Aikido is a martial art based on classical Japanese arts and Samurai traditions. In the first 5 seconds we’ve explained a lot, and with a little luck we’ve grabbed their attention and imagination. OK, it’s a martial art. That probably confirms what they were thinking already. A Japanese martial art. OK, cool. With roots in classical arts. Oh…? They may not know what classical Japanese martial arts are, but it sounds good – and it’s even accurate. (This is not the time to start explaining about daito ryu and O Sensei.) They’ve almost certainly heard of Samurai, and have some idea what they were about. They probably think that’s cool. And there’s something there about tradition. So far, so good. We wear white gis, and we all practice together on mats in a big dojo. This is a little bit of an easy break, after that intense first sentence. A mental resting place. They may not know the word “gi” but in the same breath we’ve told them it’s something white that we wear. They will probably have seen enough movies to know what we mean. (Yes, I know they are called gi, or dogi, with no “s”, but like the “gas pumps” we need to be understood right now. Worry about teaching them Japanese later.) Likewise, even if they don’t know the word dojo, we’ve told them it’s a big space with mats. They know what a high school gym looks like, so they can picture this, too. They may even feel a little smarter, because they’ve just understood us perfectly well, even though we used some unfamiliar words. And they know that we all practice together. Not only does it help paint the picture of the physical environment, there’s also a nice ring of community in it. We use weapons and empty-hand techniques to learn how to resolve conflict fluidly and effectively, instead of reacting out of fear or tension. Weapons are important in the practice of Aikido, but I’m mentioning them here for another reason: Knowing that we practice with weapons may help counter any “wimpy” impressions they may have about Aikido. We also have “effective” in there. If you are talking to someone who seems a little cautious about the whole “martial arts are scary” thing, just start with “We learn how to resolve conflict…” Without really needing to understand any details or philosophy of the practice, we’ve got “resolve conflict, fluidity, and effectiveness” overcoming “reaction, fear, and tension.” Who wouldn’t want that? And again, it’s accurate. 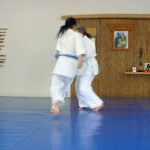 Aikido is a martial art based on classical Japanese arts and Samurai traditions. We wear white gis, and we all practice together on mats in a big dojo. We use weapons and empty-hand techniques to learn how to resolve conflict fluidly and effectively, instead of reacting out of fear or tension. Stop there, and see if they have any questions. Remember to keep answers very short and simple. You’ll want to come up with your own elevator speech, in your words. Just remember to follow the guidelines above. Speak so the listener understands. Give them what they need to paint the picture in their mind. Come with me Friday night and watch a class. People do it all the time. We have chairs for visitors, and sometimes have two or three people checking it out. New students are even required to watch a class before they can join, so it wouldn’t be weird at all. I’d love to hear your Aikido elevator speech! If you’ve come up with a good, quick explanation, please share it in the blog comments on AikiWeb, on Facebook, or when I see you at the dojo!